The debut issue of The Twisting Stair, an old-school dungeon design newsletter from Tony Rosten and myself, is now available! Issue #1 is professionally printed in the USA, 16 pages in length, and costs $4 per copy. All prices are in United States Dollars (USD), and we may need to change them with issue #2 (which may be larger than the 16 pages in issue #1), or if I go to the post office and find that our due diligence didn't quite pan out for some reason. New orders can be placed by sending $4 per issue and using the above postage guidelines to calculate postage due. You can submit payment via Black Blade Publishing's Paypal account (we'll eventually set up TTS with its own Paypal account) and send payment to tacojohndm@yahoo.com. If you would like to buy more than 2 copies of The Twisting Stair #1, you'll have to request a postage quote by emailing thetwistingstair@gmail.com, then Tony or Allan will get back to you. If you have any questions, please post them here, or via the Google+ community at https://plus.google.com/u/0/communities/106374654367308480302 or the Facebook Page at https://www.facebook.com/The-Twisting-Stair-188990931592220/ or email us at thetwistingstair@gmail.com. Issue #2 will release at the North Texas RPG Con in June 2017, and be available at the Black Blade Publishing booth. Timothy Connolly just published a guest blog post that I wrote about my top 7 favorite worlds builders: "grodog’s Song of Seven – The Mythic Worlds Builders." At GenCon 2007 I received a refresher course on one-way doors while co-DMing the Bottle City level of Castle Greyhawk with Rob Kuntz. This was my first play experience using one-way doors in at least 15 years, and Rob’s take on them was quite a bit different from how I had always pictured them in my head. In Rob’s view, one-way doors acted as normal doors from the “door side” and once the PCs passed through them, the door closed (automatically if not spiked), and was gone. From the “wall side” the one-way door was detectable as a secret door, but even then could not be opened with a knock spell. I had always pictured one-way doors as doors visible from both sides, but only being openable from the one-way side---the other side appeared as a normal door that could not be opened (I may have unconsciously been following the lead of Roger Musson’s “Dungeon Architect” comments on one-way doors here). I like Rob’s version better, for reasons that’ll become clear soon. On the Bottle City map, Rob used the now-standard false door symbol to represent one-way doors. This shared symbol appears in the sample dungeon map in Underworld & Wilderness Adventures on page 4, and denotes a false door on that map. The now-standard false door symbol is also used as the one-way door symbol in the 1978 monochrome editions of G3 Hall of the Fire Giant King and S1 Tomb of Horrors, and the S1 usage of the symbol is easy to confuse with a false door (a problem even more evident in the 1975 Origins tournament version of Tomb of Horrors). The symbol for one-way doors standardizes in 1981’s Moldvay Basic rulebook, also used for the 1981 green-cover edition of S1. One-way doors are specifically mentioned in OD&D: “Doors which are openable from one side only” (U&WA, page 6) and “Doors which will open to allow traffic into an area but not out of it” (Greyhawk: Supplement I, page 61). Appendices G and H of the Dungeon Masters Guide also list “door, one way” and doors and stairwells as sample trap- and trick examples and building blocks (pages 216-217). I like Kuntz’s definition of a one-way door---any door that appears like a normal door from one side, but is a wall from the wrong side, with no physical hint that a door exists on the other side. One-way doors reinforce the utility of iron spikes as standard equipment for PCs, and (if detectable) also provide DMs with leverage against players who constantly search for secret doors---PCs may discover the wrong side of a one-way door, with no way to open it from that side, which will waste time and generate more wandering monsters while they futilely roll d6s…. One-way doors can be placed as standard one-way doors or as one-way secret doors, and other dungeon features can easily be defined as one-way corridors, stairwells, chutes, covered pits, etc. Variable features behave with more uncertainty than reliable, though tricky, dungeon features like one-way doors: the variable stair can lead up or down, and while it is still trustworthily predictable, the PCs don’t know that, of course---to them the stairs appear very unpredictable, and their maps will be befuddled. While the change in the state of a variable stairwell from up to down is obvious, it has some subtle implications. How often does the stairwell change? What triggers the change? Can the change be specifically invoked to shift the stair to the direction the PCs desire, and if so, how? What does the stair look like from the other/up side, when the stairwell is currently going down (and vice-versa, of course)? The answers to these questions lead to a variety of adventure possibilities for a DM, and potential headaches (and challenges, and perhaps rewards) for the players. The key to take away from the U&WA suggestions above, and the idea of variable stairs in general, is uncertainty: after exploring a dungeon level for awhile, PCs shouldn’t necessarily know with surety that they are still on the same level, and they shouldn’t necessarily be able to rely on their return route being the same as they attempt to exit the dungeon, even if they’ve mapped correctly. Variable stairs help to drive that uncertainty, in two stages of features: predictable and unstable. One of they key differentiators between one-way- and variable dungeon features is their reliability. That is, a one-way door behaves the same way each time you encounter it: the door cannot be opened from the wrong side, but when it is opened, it always opens into the same hallway or room (although the PCs cannot return to their original location by simply reversing their direction of travel). Predictable variable stairs (or other variable features) may lead to different places when encountered at different times: when first found, variable stair A leads down; when passed on the way back out, stair A leads up instead of down. That is, stairwell A leads down to level 2 or up to sub-level 1a, but within the scope of those two constraints, stair A behaves otherwise itself. It is predictable, though variable. Now, if the DM changes the frequency of stair A’s options, it become a bit more uncertain, and a bit more dangerous: if stair A leads down to level 2 5 times in 6, and up to sub-level 1a 1 time in 6, that’s going to make level 1a much harder to access (and potentially to leave when the time is right). It’s also going to make sub-level 1a a place that the PCs can be stranded within, that will require them to pack plenty of iron rations in case the stairwell gods are not with them when they’re trying to leave (or enter) that sub-level…. Clearly, stairway B is not nearly as predictable as stairwell A. And we’re not done yet! What if stair B also disappears completely after it is traversed, and doesn’t reappear for 1-6 turns, or hours, or even days!? If the feature is gone, is another area revealed in its absence---that is, with stairwell B not present at all in key #62, is a door (perhaps one-way?) into key #63 now visible that would otherwise be inaccessible while the stairs were present? Worse, what if stair B behaves differently upon ascent vs. descent: the PC will have fought their way through a level 8 encounter, and decided to beat a hasty retreat back to level 4, only to find that stair B now leads elsewhere upon ascent (and perhaps even “ascends” into a deeper level from below!). The possibilities and combinations are practically limitless! Sub-levels are generally thought of as more-remote areas that are offset from the main dungeon’s levels; classic examples include the three levels of WG5 Mordenkainen’s Fantastic Adventure (sub-levels to the main Maure Castle/Castle El Raja Key complex), and the Interdicted Prison of Zuggtmoy and the Elemental Nodes sub-levels in T1-4 The Temple of Elemental Evil. However, using one-way and variable dungeon features, DMs can insert new levels into old, well-trodden paths, by changing an existing door or stair into a variable one. This new sub-level is territory added to the known and explored regions of the level, but is accessible through a newly-changed dungeon feature (or the newly-discovered property of a rarely-varying feature, if the stair only leads up 1 time in 20, for example). PCs could learn of the new sub-level’s existence by hearing rumors at the local alehouse, or through finding a map that disagrees with their own, or observing the feature behave differently when employed by monsters or an NPC party, or from legends that “The Fox’s Hole” is only accessible from the SE stair when the moon is full. Regardless of the method, by employing one-way doors, variable stairs, and the other sundry dungeon feature combinations, DMs can easily insert new levels or sub-levels to expand existing territory beyond the map’s edge, or even to overlap new and existing territory within a level. That is, with a variable door, an entirely different map may exist beyond the door, a level with features that would conflict with the previously-known level map. If the new sub-level is self-contained and only accessible from the variable feature, then living creatures will probably be less common on the level unless it has a food supply and/or its inhabitants can create food and water (or don’t require such, like golems, undead, etc.). Any sub-level isolated by a 1 in 8 or greater chance of not being found becomes a very appropriate challenge for higher-level adventurers, and presumably for placement in the lower dungeon levels. However, don’t discount the possibility of making such rare sub-levels accessible from one of the upper levels of the dungeon complex, too, since any group of explorers (lower-level or higher-level) are less-likely to find the Hideous Sub-Level of Doom in the first place. To introduce this concept of variable stairs providing access to sub-levels, a DM should insert some examples that will teach players the ropes of such features: perhaps some of the sub-levels have multiple means of ingress and egress, and perhaps the variable features are strictly binary, or if they disappear completely they’re only gone 1 time in 2 to 1 time in 4. Springing such features on players with no experience with this kind of trick can be very frustrating, so building up their confidence by setting expectations with background information in-character, as well as an initially–forgiving play experiences will allow a DM freer reign to turn the heat up on such challenges as the PCs and players grow more experienced. In addition to their utility for managing access to sub-levels or to new levels added within a well-known and explored level, one-way doors and variable stairs provide an additional level of variety and challenge within the campaign dungeon environment. These trick features force players to stay on their toes and also reward careful player mapping---and mapping is perhaps the best way to defeat these devices (along with knock, dimension door, and passwall, of course!). A word of warning though: one-way doors are easily susceptible to abuse as channeling devices if over used. The occasional series of one-way doors that herd PCs toward some special encounter or to a stairwell down four levels is OK, but if one-way doors always force players into yet-another Kobayashi Maru or Catch-22, the features will quickly lose their charm. I tend to think of one-way doors primarily as trick encounters but they can also act as channeling traps too by forcing PCs into environments that they would not have otherwise explored, or by trapping them in an environment that would not otherwise have willingly chosen to enter, without a known path of return. Variable doors and stairs are potentially much more dangerous, since they force PCs to wait for the feature to return or reopen (which may take hours or days! ), or to explore further in the hope of finding egress and a return to known paths. If the variable feature opens into a sub-level, however, it’s entirely possible that the feature itself may be the only means of entrance (and exit!) to that sub-level…. One-way doors and variable stairs can help hidden sub-levels to remain hard to find, and hard to return from, and keep your players on their toes as they wonder whether the stairwell that they used to access the Hidden Crypts of Boccob will still be there when they are ready to return to sunlight, fair maidens, and fine ale. I hope you’ll enjoy adding them to your campaign dungeons! * I haven’t been able to track down the exact origin for variable stairs as I’ve described them; I’m pretty sure that I read about them somewhere, but it’s possible that I just combined the U&WA descriptions of the trick stairs and added my own twists. If you find a definitive source, please let me know! "One-Way Doors, Variable Stairs, and the Accessibility of Sub-Levels" first appeared in Knockspell Magazine #1 (Winter 2009). This version of the article includes the errata published in FKQ#2 that expands and corrects the second paragraph. A picture of the signatures sheet for the first edition printing of Tales of Peril: The Complete Boinger and Zereth Stories of John Eric Holmes, before we mailed the sheets off to the printer last month (which is why they're in plastic). Chris Holmes, Zach Howard, and I signed the sheets at the 2016 North Texas RPG Con. The book is in layout now, and is Black Blade Publishing's first foray into fiction. It will premiere at the North Texas RPG Con in June 2017. GaryCon IX has come and gone, and if I had to choose just a few words to summarize the show, they would be “bigger, better, funner!” (even if that’s not quite grammatically correct). Jon Hershberger and I had an excellent time at the convention, and were well-treated by Luke Gygax’s GaryCon crew, led by the inestimable exhibitor-ninja-in-chief, Mike Noe of IronWind Metals (who also graciously filled some gaps in my range of Tom Meier troglodytes, and replaced some lost pieces to my Dennis Beauvais Bridge of Sorrows boxed set). Many thanks to our Goodman Games colleagues who helped to manage the booth at GaryCon this year, especially Michael Curtis, who also helped to set up the booth on Wednesday evening, and Joseph Goodman. Our nearby neighbors included Jeffrey P. Talanian, of Astontishing Swordsmen & Sorcerers of Hyperborea fame (who introduced us to Del Tiegler—it’s always great to meet someone in person you’ve worked with in the past! ), and the Frog God Games crew—Zach Glazer, Skeeter Green, and Bill Webb—who supplemented by the two-fisted North Texas RPGCon’s own Michael Badolato, and Erik Tenkar (of Tavern infamy). We were also able to catch up with Harley Stroh, Bill and Ben Barsh of Pacesetter Games, Shawn and Devon Hibbs of DieCast Games (thanks again for that copy of Rob Kuntz’s Garden of the Plantmaster), Paolo Greco, Tony Rosten, Jon Peterson, Jim Kitchen, and numerous other friends, artists, designers, and fans while at and away from the booth. Jon and I got an early jump on the drive up to Lake Geneva, leaving Wichita by 6:45pm or so, and driving up to just past Kansas City. We overnighted in Liberty, MO, and shaved three or four hours off of our Wednesday drive time. We pulled into the Grand Geneva around 4pm, which was a bit later than we’d have preferred, but still two hours earlier than last year’s arrival. The drive was unevenfully boring, which is just right! Unloading the minivan was quicker this year, thanks to the able-bodied assistance of Michael Curtis, Tony Rosten, Rich Franks, Guy Fullerton, and Joshua Ford! Booth set up, however, still took about 6 hours of effort, which, alas, put the kibosh on our plans for a relaxed Wednesday dinner with gaming for dessert. The Black Blade booth was very busy for the first few of hours that the dealer’s hall was open to all attendees, but was pretty manageable once our iPad finally re-connected to the hotel wifi. In my first Castle Greyhawk game at 6pm, I had a crew of 10 players, and they opted to explore my new “Diamonds in the Rough” level. **** SPOILERS for grodog’s 2017 North Texas RPGCon events **** The party fell into a trap inspired by David LaForce’s DMG illustration on page 68 (a skeleton attacking PC in a flooding room), then wandered through the outskirts of the level proper where they battled giant wasp wandering monsters, and encountered a prism ward (a lights-driven crystalline monster from Expedtious Retreat Press’ Malevolent & Benign), an ice-magics-wielding cryosphinx and her pet dragonne (twice! ), as well as a trio of hungry mimics. The giant wasps and cryosphinx both offered some memorable and rather unexpected role-playing opportunities. While several PCs were paralayzed by wasps or blinded by the prism ward, all of the PCs in this crew survived their descent into the depths of Castle Greyhawk. My thanks to Skip Williams and Dave Conant and the rest of the GaryCon events staff for locating my events in a boardroom this year (although I was quite surprised to discover that the boardrooms weren’t equipped with whiteboards! ), and to James Lopez, Scott Mayne, Emily Chandler, Shiv Chopra, Guy Fullerton, Eric Netteberg, Sofie Netteberg, Michael Simon, Todd Douglas, and Todd Bunn for kicking off my gaming at GaryCon right! The Black Blade booth was again quite busy today, and unfortunately I wasn’t able to eat lunch until 3pm or so. In my evening Castle Greyhawk game, a full table of 12 players chose to explore “Diamonds in the Rough.” **** SPOILERS for grodog’s 2017 North Texas RPGCon events **** This group entered the level from the opposite side of the NE corner, and covered some different ground than the first group, including meeting a mottled worm (who swallowed whole the halfling fighter/thief, but who was restored to life through a wish after rescue by the monk). Soon after they were ambushed by two lurkers above while triangulating with a Treasure Finding potion, which nearly resulted in a TPK (only two PCs were not under a lurker, and in the end, four of the twelve PCs were suffocated before they could be rescued, including the recently-raised hobbit). The PCs then wandered down into the main giant wasp nest area, blasted it with a back-to-back fireball and cone of cold, recovered some loot and then fled when more wasps arrived. During their flight, one of the PCs drank two concurrent potions, so I was able to roll on the Potion Miscibility Table, which is always a treat; the results were miscible, however, so nothing exciting happened. Some notable quotes: “Quietly is for sissies”—Keith; “Caution, who needs that” (or something approximating that concept)—Tim, just prior to his halfing being eaten by an aquatic purple worm; “Is that Jim Ward?—I don’t think so” (heard in the hallway, apparently referring to me). Thanks to Noah and Alex Guilbault, Kevin and Patrick Kelly, Keith and Brian Sloan, Dex Briggs, Tim Deschene, Jeffrey Lulac, Jeremy and Zander Ligman, and Glenn Cox for playtesting this new scenario! For my third Castle Greyhawk game, I had a full crew of 12 players, who also selected my new “Diamonds in the Rough” level to play. **** SPOILERS for grodog’s 2017 North Texas RPGCon events **** The Saturday crew explored some of the same ground as the previous two teams, but avoided the mottled worm encounter. On their return to the large octagonal chamber, they were somewhat startled to discover a door that hadn’t been there previously (it was, of course, a mimic). Then they travelled to the SE and into the depths of the giant wasps’ nests, where they battled not only the wasps, but their demonic wasp-demon masters! Having awoken the hives, and down at least two PCs due to poison, they decided to wish their way to safety and the largest treasure on the level. This landed them in one of the big encounters in the main portion of the level, standing atop a small mountain of gemstones, and facing down a diamond dragon. Behind the dragon rested the Jacinth of Inestimable Beauty. Some excellent reaction rolls and well-timed negotiations and role-playing allowed the PCs to escape the dragon’s lair intact, save for Carlos’ magic-user who dimension doored himself into solid matter and the Astral Plane, where he was picked up by an evil elder titan and hauled off to Tartarus. Notable quotes: “I don’t even trust myself”—Axiom; “I still don’t trust the ceiling”—Carlos; “I cast neutralize poison on the dwarf” (repeated twice for emphasis! )—Don (I think, may have been JC). Thanks to David “Axiom” Konkol, Steven Danielson, Joshua Ford, Patrick Baumgard, Don Porter, Tim Downs Mullen, JC Luxton, Merideth Nepstad, Carlos Lising, Mike Bridges, Jayson King, and Guy Fullerton for playtesting the “Diamonds in the Rough” level! Between the three groups, about 30% of the level was explored, so I’ll likely adjust the starting locations for my sessions at the North Texas RPGCon in June so that they can explore the level from different points. Saturday evening I played in Chainsaw’s Foolsgrave living mega-dungeon, using Jeff Talanian’s ASSH rules, and had a great time. **** SPOILERS for Chainsaw’s 2017 North Texas RPGCon events **** I ran a Necromancer, animated two previously-slain PCs as skeletons, and was able to advance to second level (although I only gained 1 hp, alas!). The mapping was a blast, too—our crew spanned four sheets of 8.5”x11” graph paper, and passed through two secret doors into what seemed like previously-unexplored territory. Chainsaw’s encounters were quirkily fun and deadly too---a mini-Death Star robot, some giant blue lightning bugs, living chests of wandering treasure, and the opening encounter really set the tone for the session wonderfully, as well! The table of players was Noah and Alex Guilbault, Kevin and Patrick Kelly, Scott McKinley, Michael Simon, and Tom Trombly, and we had a great time wandering through the deathmaze that is Foolsgrave! Booth teardown went quickly, thanks to the help from our friends Guy Fullerton, Rich Franks, Joshua Ford, Kevin Kelly, Jen Brinkman, and Jeff Goad. I finally got to play in Joe “gizmomathboy” Klein’s Circus Maximus variant “Moebius Maximus,” which was quite fun (although we only played for an hour or so). I’ve been looking forward to this since last year’s GaryCon! A large group of friends usually get together to eat dinner and game on Sunday night, shutting GaryCon down in the process. I wasn’t planning to run a game this year, but given the number of folks we were expecting I came prepared to DM, and in the end I ran six players (mostly from Handy’s NYC crew) through my version of The Black Reservoir level from the Expanded Castle Greyhawk. 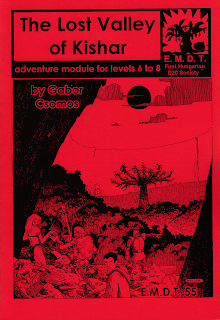 You can view the original map by Rob Kuntz in the El Raja Key Archive at http://www.tlbgames.com/collections/archive, and can read Gary’s short story that I based the level on at http://www.greyhawkonline.com/grodog/gh_castle_black_reservoir1.html. **** SPOILERS for grodog’s 2017 North Texas RPGCon events **** This crew explored quite a bit of the southern “shore” of the Black Reservoir before venturing out onto the raft, variously battling some pteranadons, giant crabs, and giant pikes. They followed the line of columns out to the center of the level, then to the east. Upon their return they discovered the lever that lowered all of the stone columns in sight, which released the dreaded dragon turtle from its cage. The beast attacked, steam-frying much of the party, despite valiant efforts to flee it, distract it, and/or obstruct its deadly charge. In the end, two PCs survived the battle (after the dragon turtle had been damaged to near 50% of its hit points), one swimming north into the level, the other travelling south to their starting location. Neither survived to escape Greyhawk Castle in the end, however, so the Black Reservoir remains one of the few levels I’ve run that has multiple TPKs behind it (see Luke Gygax, you’re not the only one to contribute materially to the dragon turtle’s hoard! :D ). We wrapped up the game at 4am, and I crashed until we awoke for the long drive back to Kansas on Monday, which was as equally hum-drum as the drive up, thankfully! Welcome to From Kuroth's Quill! Kuroth is the namesake for the artifact Kuroth's Quill from the 1979 Dungeon Masters Guide by Gary Gygax (and diverse hands). I always loved reading the "From the Sorcerer's Scroll" columns penned by Gary (and sometimes Rob Kuntz) in The Dragon and Dragon Magazine, and with "From Kuroth's Quill" I hope to evoke that same sense of design scope and focus, as well as to acknowledge Gary's column through my column's title. I began to write the first "From Kuroth's Quill" (sub-titled "One-Way Doors, Variable Stairs, and the Accessibility of Sub-Levels") in late 2008 for Knockspell magazine, and despite Knockspell's premature demise in 2011, I've continued to write and collect material "for" the column over the years. Some of those pieces have appeared as forum posts at The Knights & Knaves Alehouse or various World of Greyhawk sites (like Canonfire! ), or in Scott Moberly's AFS magazine, but most remained unpublished. I've toyed with the idea of a blog several times in the past 20 years, but never felt like I could devote sufficient time to making it a continuing, viable platform. But the idea never quite went away either. I started working on this incarnation of the blog in the summer of 2016 to collect my old "From Kuroth's Quill" columns, and to scratch the itch for writing more of them. That in turn morphed into writing and publishing a print-only newsletter dedicated to dungeon design, with Tony Rosten. 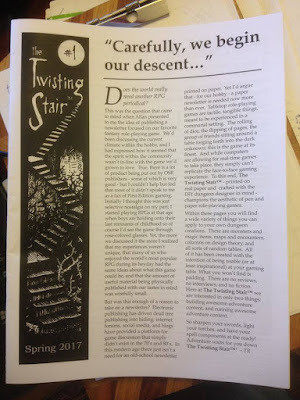 The Twisting Stair is now my in-print vehicle for "From Kuroth's Quill" and the blog here will host additional pieces. Happily, I think that the resurrection of "From Kuroth's Quill" is now complete! (and I do currently have the beard still, too!). 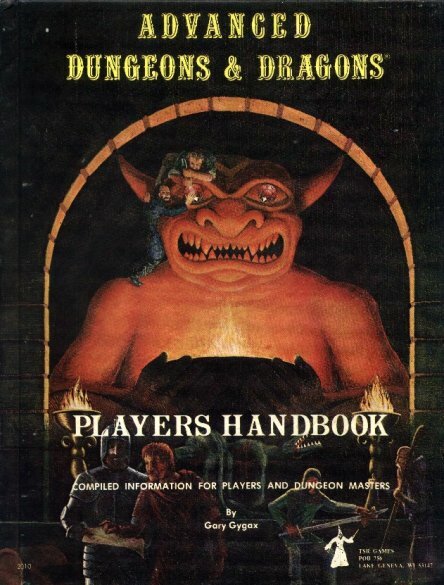 Allan T. Grohe Jr. has been playing AD&D and other RPGs since 1977. Allan’s first professional gaming publication (“More for the Shadow Master”) appeared in White Wolf Magazine #11 in 1987; he has also contributed to The Unspeakable Oath, Pyramid, Polyhedron, and Dragon Magazine, among others. Allan has worked extensively with Biohazard Games (Blue Planet, Upwind), Pagan Publishing (Delta Green), Different Worlds Publications (Tadashi Ehara), and Pied Piper Publishing (Robert J. Kuntz). Allan co-founded Black Blade Publishing with Jon Hershberger in 2009 to publish top-quality old-school gaming products, including OSRIC, Monsters of Myth, and Kuntz’ The Original Bottle City. 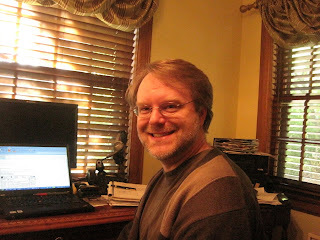 Allan’s most-recent projects are Tales of Peril: The Complete Boinger and Zereth Stories of John Eric Holmes, and The Twisting Stair, a gaming newsletter focused on dungeon design that Allan publishes with Tony Rosten. Allan’s editorial, design, and development work has contributed to winning one Origins Award and securing four Origins Award nominations, winning one ENnie Award and two ENnie Award nominations. 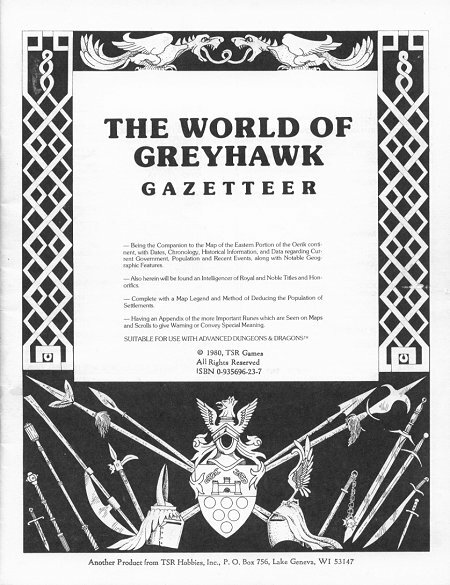 Allan is known online as grodog, where he publishes a website featuring World of Greyhawk content, as well as his non-gaming writing (poetry, personal essays, and literary scholarship), and the usual fan ephemera at http://www.greyhawkonline.com/grodog/. He lives in Wichita, Kansas, with his lovely wife Heather, their two wonderful sons Ethan and Henry, and their two pugs Tara and Gypsy. Thank you for visiting, and hopefully you'll find some worthwhile ideas at "From Kuroth's Quill" that will be useful in your games! I welcome your responses, feedback, suggestions, ideas, and constructive criticisms.